One of the main questions raised by the ongoing trade negotiations between the United States and five countries of Central America—Costa Rica, El Salvador, Guatemala, Honduras and Nicaragua—is why these very small economies have decided to negotiate a free trade agreement (the Central American Free Trade Agreement, known as CAFTA) with the biggest and most powerful economy in the world? Finally, a third question has to do with some of the main lessons that can be drawn from the way these negotiations are taking place. This essay tries to answer these questions by means of a brief review of the present state and prospects of the ongoing negotiations. The main justification for a small economy, or a group of smaller economies, to undertake a negotiation of a free trade agreement (FTA), or any other form of economic integration, is to overcome the limitations that the smallness of the market imposes on their growth and development. The central purpose is to attain the economies of scale that smaller markets do not allow.2 Additionally, there are gains from the efficiency brought about by the increased competition generated by wider markets. These are some of the most obvious benefits, derived from opening these economies, because the smallness of their markets has often led to the creation of one, or at the most two companies, which enjoy the exclusive privilege of supplying almost captive demand for their products. Those who are familiar with the economic history of Central America know that one brewery or one cement factory, for instance, has dominated these small markets without challenge, for many years. Smaller economies negotiate FTAs because by widening and deepening their markets they become more capable of attracting foreign investment. Therefore, beyond the gains from increased trade generated by economic integration, other more dynamic benefits justify market expansion as an instrument to attract foreign investment. The second, relatively more peremptory, objective that justifies the decision to negotiate FTAs by smaller economies, has to do with their trading partners. By definition, smaller economies that participate in international trade are “price takers.” They do not have the capacity to create, or influence decisively, the conditions under which they participate in trade relations. Usually, these conditions are set by the dominant players in international trade, or by the “principal suppliers,” as they have been traditionally known. For this reason, smaller economies have to exhibit an exceptional capacity to adapt to circumstances created by others, in order to obtain the benefits of international trade. For the Central American economies, since it was their main trading partner—the United States— who decided to engage in the negotiations, they had to stand ready to negotiate once the opportunity to do so became available. Because the worst case scenario, for any small economy, is to be left out of those negotiations made possible by the disposition to negotiate of the principal players in the international trading system. Contrary to common past perceptions, negotiations between asymmetrical trading partners are no longer perceived as having a predetermined outcome in favor of the bigger and more powerful participant. Fear of this zero-sum outcome inspired in the past a loud rhetoric of confrontation between North and South, in great measure inspired by the fact that no possibilities were perceived of achieving mutually beneficial outcomes through negotiations. With the end of the Cold War and the emergence of one international economy, the search for these mutually beneficial outcomes has now moved beyond the rhetoric of confrontation to the negotiating table. Although some manifestations of the North-South confrontation sometimes still flare, these are better understood as part of the accepted posturing that normally precedes and accompanies the process of negotiation. Finally, precisely because they cannot determine the conditions in which they trade, smaller economies need to actively engage in trade negotiations in order to increase their capacity to import, and therefore, their capacity to grow. Today, there is a wider recognition that imports are the main motivation to engage in international trade. The vision of a trade policy aimed at increasing exports to achieve a positive trade balance, for its own sake, is no longer dominant. In today’s interdependent world economy, exports are one of the means to enable an increased capacity to import the necessary raw materials, capital goods and technologies that are essential for economic growth. In Paul Krugman’s words, “imports, not exports, are the purpose of trade. That is, what a country gains from trade is the ability to import things it wants. Exports are not an objective in and of themselves” (Krugman, 1997, p. 120). A second set of questions has to do with why the CAFTA negotiations are happening now. Given the relatively small influence that the Central American economies exercise in the international trading system, the answer to this question must be found elsewhere. The main factor that explains why these negotiations are happening now has to do with a gradual and significant change in the commercial policy of the United States. After the end of the Second World War, among the central objectives of U.S. commercial policy was to support a multilateral trading system, which in 1948 led to the creation of the General Agreement on Tariffs and Trade (GATT). Under the conditions expressed in Article XXIV of the GATT, the United States supported, but refrained from participating in, regional or subregional processes of trade liberalization, such as what is today the European Union and, after some hesitation, the economic integration of Central America. One outstanding exception to this policy was a free trade agreement with Israel, which entered into force in 1985, mainly inspired by strategic reasons. What has changed is this reluctance by the United States to engage in trade agreements that involved selected parties rather than concentrating on trade liberalization through the multilateral global trading system embodied in the GATT. 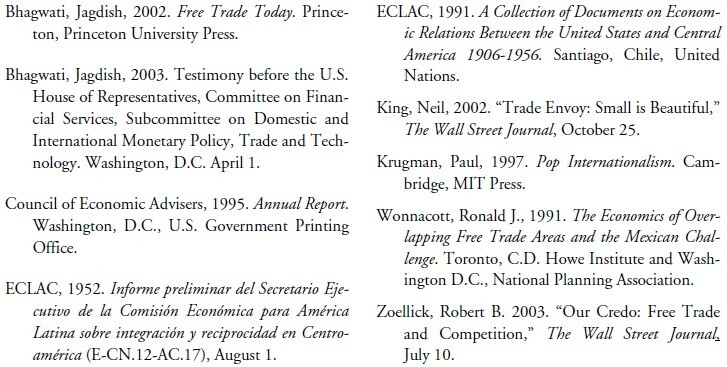 Today, the United States is actively involved in trade negotiations of all sorts, bilateral (as those that led to bilateral agreements with Chile and Singapore—or plurilateral (as those ongoing with the five Central American economies and with the rest of the Western Hemisphere or those in the early 1990s that led to the North American Free Trade Agreement, NAFTA). This policy shift started gradually, in 1965, with the entry into force of the agreement between Canada and the United States that was known as the Auto Pact, to regulate trade in automobiles and auto parts. The Auto Pact was so successful that by 1986, when negotiations were started for an FTA between the United States and Canada, automobile-related trade between the two countries represented one-third of their bilateral trade. The Canada-U.S. FTA entered into force in 1989 and formalized one of the most intense trading relationships existing between any pair of countries. No other pair of countries trade as much as the United Sates and Canada; today, more than one billion U.S. dollars in goods and services cross (both ways) the Canada-U.S. border each day. In 1991, when it was announced that Mexico and the United States were about to open negotiations for a trade agreement, similar to the Canada-U.S. FTA, the Canadian government proposed to join the negotiation, thus transforming the originally-intended bilateral negotiation, into a multilateral undertaking. The concern that led to Canadian participation in what later became the NAFTA was avoiding the emergence of what has been called a “hub and spoke” type of trading arrangement (Wonnacott, 1991). The risk was that should the United States negotiate an FTA with Mexico after already having one with Canada, the United States would become a “hub” linked through bilateral agreements to different “spokes,” with the spokes not having trade relations among themselves. The hub would, therefore, become the most attractive location to invest because it would have access to the spokes, while investment in the spokes would be confined to each one of them. By contrast, a multilateral arrangement, where all the parties liberalize trade among themselves, would allow more trade between the spokes, and a wider distribution of some of the dynamic benefits of trade liberalization. NAFTA entered into force in 1994 and almost immediately began generating remarkable results. For instance, in a few years, Mexico displaced Japan as the second largest trading partner of the United States and investment flows responded accordingly. Besides the fact that it was the first trade agreement signed by the United States with a developing country, NAFTA also became the main manifestation of the adoption by the United States of a trade policy no longer based exclusively on multilateral global liberalization. Regional, subregional and even bilateral trade agreements were perceived as “building blocks” in the path toward what remained the ultimate objective of worldwide trade liberalization. As stated in the 1995 Economic Report of the President of the United States, “when structured according to principles of openness and inclusiveness, regional blocs can be building blocks rather than stumbling blocks for global trade and investment. Seen in this light, carefully structured plurilateralism is a component rather than an alternative to U.S. multilateral efforts” (Council of Economic Advisers, 1995, pp. 213-214). This meant that, henceforward, the United States would engage in all sorts of negotiations, with individual countries or groups of trading partners, to sign FTAs conceived as building blocks in the process of global trade liberalization. This policy has been characterized as “competitive liberalization,” whereby the United States is willing to negotiate FTAs with those who are willing to do so. In the words of U.S. Trade Representative Robert Zoellick, through FTA negotiations, the United States is “spurring a competition in liberalization” (Zoellick, 2003). With the exception of the U.S.-Jordan FTA, no bilateral or plurilateral negotiations were completed during the administration of President Clinton, because the Congress had not granted the President authorization to negotiate trade agreements. Only with the approval by the Congress of the United States, in August 2002, of what is known as “trade promotion authority (TPA),” formerly known as “fast track authority,” several negotiations were activated, including the Doha Round within the World Trade Organization (WTO). Additionally, bilateral negotiations have been successfully completed with Chile and Singapore. Meanwhile, negotiations for the Free Trade Area of the Americas (FTAA) have moved into a more decisive phase and negotiations with the five Central American governments to create the CAFTA, have been evolving consistently toward completion by the end of 2003. Standing in line are negotiations with Morocco, Australia, the countries of the South African Customs Union (Botswana, Lesotho, Namibia, South Africa and Swaziland), Bahrain, the Dominican Republic and Colombia. Finally, this change in policy and the consequent flurry of negotiations that it has unleashed, have not happened without generating acute criticism from detractors. Among them, the most intense criticism has come from defenders of the global trading rules embodied in the WTO. Columbia University Professor Jagdish Baghwati, one of the most outspoken critics of bilateral and regional FTAs, has been called “the prime warrior for free trade.” In testimony presented to the United States House of Representatives in April 2003, Professor Bhagwati claimed that it is among politicians that there is a preference for bilateral FTAs, while “a vast majority of economists consider them a plague on the world trading system” (Bhagwati, 2003). The proliferation of partial, as opposed to global, trade agreements has created what Professsor Bhagwati characterizes as “a massive systemic problem,” whereby trade “preferences have multiplied worldwide through varying tariff schedules based on origin and also with varying rules of origin.” According to Professor Bhagwati, this is better described as a “spaghetti bowl problem, with preferences like noodles crisscrossing all over the place” (Bhagwati, 2002). Professor Bhagwati is also critical of the policy of “competitive liberalization,” promoted by U.S. Trade Representative Robert Zoellick, arguing that it does not contribute to multilateral trade liberalization. “As the bilaterals multiply,” Professor Bhagwati holds, “the willingness to invest more lobbying effort into pushing the multilateral envelope begins to weaken.” Ambassador Robert Zoellick has responded to such criticism arguing that perhaps the critics live “in a world where everybody will agree at once to open their markets, but that’s not the world that I see out there” ( King, 2002). One of the salient lessons that can be drawn from the undergoing CAFTA negotiations has to do with the quite extraordinary and unprecedented fact that the five Central American governments are participating as a group. It is extraordinary and unprecedented because this has not been the case until now. Even when these five governments have negotiated trade agreements together, they have made it very clear that such agreements would not apply bilaterally. This is the first time that these five governments are negotiating a trade agreement that will be enforced multilaterally. Therefore, in the ongoing trade negotiations with the United States, by contrast with other recent negotiations, the Central American governments are participating with an unprecedented degree of cohesion. The process of Central American economic integration, which began in the fifties, has yet to lead to the emergence of a common commercial policy among the participants. The negotiations with the United States represent the very first time that these five governments attempt to negotiate an agreement that will be enforced multilaterally, rather than bilaterally, as it has been the case with other agreements negotiated recently by the Central American governments. Several factors explain this outcome. For the Central American economies, the United States is their main trading partner, representing about half of all their international trade, and their main source of foreign direct investment. Furthermore, almost 75 percent of all Central American exports to the United States already enjoy duty free access, on account of the preferences unilaterally granted under the Caribbean Basin Initiative (CBI) and other preferences. However, these preferential arrangements are temporary and require periodic reauthorization by the Congress of the United States. By contrast, an FTA between the United States and Central America will institutionalize, and therefore make more stable, the rules that govern an already intense and profound trade relationship. The sum of imports and exports between the United States and Central America amounted in 2002 to more than US$20 billion. Foreign direct investment from the United States amounted to more than US$3 billion in 2001. Another important lesson which can be drawn from the ongoing negotiations relates to the compatibility of the Central American economic integration process, which has existed for almost half a century, with the FTA they are negotiating with the United States. Even without a formal agreement, trade relations between Central America and the United States are relatively more profound and intense. As noted above, trade relations with the United States represent half of all Central American foreign trade. By contrast, trade relations among the Central American countries represent around one third of their total foreign trade. The process of Central American economic integration needs to be adapted and upgraded to make it compatible with the potential widening and deepening of the relationship with the United States. Otherwise, there is a risk that the countries of Central America will become more interdependent with the United States, at the expense of their relations. As a consequence, intra-Central American relations may become rarefied, as relations with the United States intensify. Several issues demand attention within the Central American integration process. A few examples are presented here, to illustrate the sort of adaptation that will be necessary to achieve compatibility between both trade agreements. • First and foremost is the common external tariff. If it is the intention of the Central American governments to continue acting as a group, at least in their trade relations with the United States, it will be necessary to complete the common external tariff, which according to optimistic estimates already covers around two thirds of all tariff items. Otherwise, it will be necessary to streamline and tighten the very relaxed rules of origin which prevail within the Central American integration process. Based on an honor system, present rules of origin require a sworn statement by the producer that the goods have been produced in Central America. These rules of origin need to be upgraded, at least to bring them to the same level of formality as the rules of origin that will be agreed in the CAFTA. • A second issue that will need revision is the dispute settlement procedure that has been agreed among the Central American countries. Both the CAFTA and the Central American dispute settlement procedures should coexist harmoniously, each serving as mechanisms for solving disputes that will emerge between the Central American governments themselves and with the United States. Be it as it may, these adaptations and adjustments to the Central American integration process will have to be done after the conclusion of the CAFTA negotiations. In the meantime, perhaps the Central American governments can agree on a general principle whereby they are willing to extend to each other the same concessions that they will grant to the United States. This general principle will assure that the process of Central American integration, at least, will not lag behind the process of liberalization that will be unleashed by the approval of the CAFTA. 1. With the breakdown of the multilateral trading system in the thirties, each of the five Central American governments signed bilateral, Reciprocal Trade Agreements with the United States. These agreements remained in force until the fifties, when the first steps were taken to initiate the process of Central American economic integration. ECLAC (1991, pp. 97-197). 2. The smallness of the individual Central American markets was the main argument used by the Economic Commission for Latin America and the Caribbean (ECLAC) to promote, in the early fifties, the adoption by the Central American governments of a program of economic integration. The proposal was contained in a document drafted by ECLAC’s Mexico Office and presented by Raul Prebisch, then Executive Secretary of ECLAC, to the first meeting of the Central American Cooperation Committee, held in Tegucigalpa, Honduras, in August 1952. See ECLAC (1952).